A young Scots lawyer acting for motorcyclists who have lost limbs in road traffic accidents is calling on the courts to standardise their approach to compensation claims for prosthetics. Jodi Gordon (28), a rising star at Motorcycle Law Scotland argues that if Judges follow the principle of the law, all amputees should be awarded state-of-the-art prosthetics and allowed the best chance of recovery and an active future. However, the vagaries of judgement mean that claimants may only be awarded funds for the very basic of artificial limbs. Her move follows one particular case where the pursuer was denied the recommended prosthetic as the Judge perceived this to be a “Rolls Royce” standard and unnecessary. The law behind civil claims for compensation following the negligent act of another is to put the injured party back in a position had the incident never occurred, but the practice is far from consistent for amputees. Jodi said: “Why shouldn’t an individual who has lost a limb, as a result of the negligence of another, be entitled to the best available if it can be seen to benefit their recovery and quality of life? “The principle of the law, which seeks to compensate a pursuer so as to allow them to return to their pre-injury life as far as possible, would seem to suggest that the best, is best. Rolls Royce should be the standard and all claims should be approached knowing that this is the case. “While we have successfully argued for compensation to cover state-of-the-art prosthetics out of court, securing consistency in legal judgements is an ongoing matter. In Motorcycle Law Scotland’s (MLS) case of Adam Wagner v Thomas Grant & Arla Foods UK PLC 2015 CSOH 51, Lord Uist made the decision that Adam was entitled to a more basic limb as recommended by the Defenders and their expert. This was despite the fact that, in evidence, Adam stated: “he could not run or kneel down, ride his mountain bike or climb ladders because of sores on his stump.” Very simple tasks which people take for granted were difficult for him: he went up and down stairs only if he had to. MLS had instructed an expert Prosthetist from Dorset Orthopaedic to assess Adam and he concluded that he would benefit from the recently available BiOM limb. This prosthetic limb used modern biomechanics to propel the user and reduce the exertion on the body. 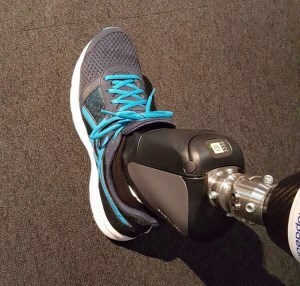 It was stated in evidence that, “It made walking, running, tackling stairs and dealing with slopes a lot easier.” Despite this, Adam was not awarded monetary compensation to allow him to purchase the BiOM limb. Lord Uist, when making the decision, stated, “In response to the question from me, he (Moose Baxter) accepted that what he was proposing was “a Rolls Royce” prosthetic arrangement.” In short, the Court decided that the BiOM limb was too costly and too high end for Adam, despite its benefits. In a subsequent case, the same rigorous assessment of a motorcyclist’s injuries was applied and the latest BiOM limb (now known as the emPOWER) was recommended as the best match for his wants and needs. On this occasion, the case was concluded before reaching a court hearing, with the compensation awarded sufficient to cover the costs of the superior artificial limb. But, Jodi worries that without more legal judgements in favour of advanced prosthetics, the uncertainty for amputees will continue. The young lawyer is now hoping to gather the support of more legal professionals to collectively demand an open and transparent discussion about the proper implementation of the ‘like for like’ legal principle as it applies to civil claims brought on behalf of amputees. Jodi continues: “No prosthetic, no matter how expensive or technologically advanced, would ever compare to an individual’s own legs and if nothing can ever replace them, do the Courts not have a duty to allow for funding of the next best thing? She added: “Although the law behind civil claims for compensation following the negligent act of another is to put the injured party back in a position had the incident never occurred, the practice has been far from consistent for amputees. “With many cases also settled before reaching the courtroom, pursuers can face very different attitudes towards the payment for prosthetics, without clear legal precedent.